The 2015-17 NABJ Board of Directors completed its Winter Meeting on Sunday and I am pleased to announce that we are off to a great start in 2016. The NABJ Board approved a HBCU Task Force and welcomed two new chapters: Savannah, Ga., and University of Central Florida. Eleven of our esteemed founders and more than 100 members gathered in Washington, D.C. on Dec. 12 to celebrate the association’s 40th anniversary. It was a powerful tribute to the men and women who founded NABJ. Our founders who are also military veterans were honored for the service. After the reception and program, members gathered in front of the White House for a group photo. A special thank you to our friends at Buick for supporting the event as the Exclusive Host Partner. We will continue to celebrate our founders in 2016, and look forward to their induction into the NABJ Hall of Fame at our annual convention in Washington, D.C.
I’ve met with NABJ members from coast to coast. Last month, I was on the West Coast for work and visited with NABJ chapter members during my travels. I served as a guest speaker at the NABJ-LA monthly meeting alongside Region IV Director Marcus Vanderberg. Prior to my visit with the Los Angeles chapter, I met with NABJ members in San Diego for a mixer. Both meetings were great opportunities to discuss industry issues and glean member insights. 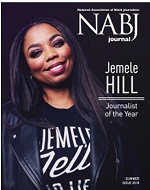 I worked with staff to initiate a new membership campaign -- #NABJCongrats. Look out for the biweekly eblasts that chronicle the successes of black journalists and media professionals. A big welcome and thank you to NABJ’s five newest Lifetime members: Xavier Dominicis, Tiffany Smith, Wale Aliyu, Kaloma Cardwell and Malena Cunningham Anderson. These five individuals joined as life members in the past 60 days as part of our “40 for 40” campaign in celebration of our 40th anniversary. Thank you to former NABJ Presidents Kathy Times and Herbert Lowe for coordinating the lifetime member campaign. I held my first quarterly meetings with the NABJ task forces and committees in January, and I continue to hold monthly calls with the NABJ Founders Task Force. The objective of these calls is to keep NABJ stakeholders up to date on the association’s happenings and progress. Get more involved with NABJ by reaching out to NABJ’s task forces and committee leaders and see how you can help. April 30 – Region I Conference at Morgan State University in Baltimore, Md. Vice Presidents Dorothy Tucker, Benet Wilson and Marlon Walker are working on advocacy efforts in their respective areas of broadcast, online and print. NABJ will publish their advocacy reports in 2016. I will be representing NABJ at the “World Media Summit” in Doha, Qatar, in March. The trip is being underwritten by the conference. I’m pleased to report to the NABJ membership that the relationship between NABJ and CNN has been renewed. In November, I had a productive meeting with CNN’s senior leadership in New York City. Look out for news about future collaborations between NABJ and CNN in 2016. The strategic planning being funded by the Ford Foundation is under way. The staff is working with members of the committee and our consultants to prepare the association for the next leg in the planning process: collection of stakeholder input. Wilson hosted webinars on the Nieman and JSK fellowships, and a student webinar on internships. Academic Representative Michelle Johnson launched a Facebook page for NABJ Educators. Our affiliate chapters are up to a great deal of good. I’d like to highlight the work being done by the Wisconsin Black Media Association, which has tapped into the power of mobile. In November, the chapter worked with Alverno College to host a Smartphone Conference. The program included a survey of must-have apps and provided training to ensure members are getting the most from their smartphone devices. NABJ has been working closely with NAHJ to plan our 2016 Joint Convention. NABJ’s convention team is led by Elise Durham (co-chair), Melanie Eversley (co-program chair), Greg Morrison and Greg Lee (finance committee). They have been working closely and cohesively with NAHJ’s respective appointees. The workshop program proposal deadline was Jan. 22 and we look forward to the program committee sifting through the 245 panel suggestions. The early bird registration deadline (March 1) is forthcoming. NABJ members who are also chapter members are eligible for a $50 chapter discount if they register by the early bird deadline (March 1) and submit the chapter discount rebate form. Convention attendees may book their rooms once they’ve registered. I visited CNBC with NAHJ President Mekahlo Medina to discuss convention program opportunities. The NABJ Board continues to stabilize the association’s financial position by implementing cost-saving measures and ensuring transparency. We have implemented a ‘back-to-basics’ strategy that includes zero-based budgeting, meaning if an event or project is not properly funded, NABJ will not execute the event or project. This strategy has been working well. Also as a cost-saving measure, we have reduced rental expense by half in our national office by renegotiating our contract resulting in a yearly savings of approximately $30,000. The Board of Directors approved the 2016 budget with a unanimous vote at its Jan. 31 meeting. Drew Berry, a lifetime member of NABJ and former general manager and news director, was hired as NABJ’s Executive Consultant in November. He has brought his expertise to help move our organization forward. Many of you may remember that Drew served as our our Interim Executive Director in 2010, when he led a $1 million turnaround for the organization in a single year. Additionally, we’ve implemented a consulting concierge system that serves the needs of corporate partners and brought the booking of travel and registration in-house, which has contributed to keeping costs down. Our momentum continues to build. Our strategy has demonstrated to corporate partners that we are moving in the right direction, evidenced by the support and commitments already received in the past 60 days. The 2013-15 NABJ Board of Directors informed the membership at the Minneapolis Convention that NABJ was tracking to end the year with a $250,000 deficit. After taking office, the 2015-17 NABJ Board conducted an exhaustive review of NABJ’s finances. I updated the membership in October that NABJ’s projected 2015 deficit was higher than the previous board reported at the 2015 convention, and the projected deficit was going to be nearly $380,000. We learned just before the Jan. 31 board meeting after the books closed on 2015, that the organization finished 2015 with an unaudited $424,324 deficit. This increase was caused by several factors, including uncollectable 2015 convention sponsorships of $25,000, which NABJ will write off. Also, NABJ also had a modest investment loss for the year of about $19,000 plus fees. Fortunately, we have been hard at work to execute our ‘back-to-basics’ strategy, and have taken proactive steps to follow my charge to ensure there is no deficit in 2016. I am excited to report that these steps are paying off. 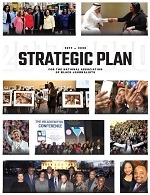 Thank you to our members and corporate partners for supporting NABJ as we execute our plan. We are confident we have the right course of action in place to achieve our fiscal goals in 2016 and beyond. We will continue to pursue further cost-cutting if applicable in tandem with expounding our fundraising initiatives. The NABJ Board and Staff will continue to work diligently to deliver value to our members. The NABJ Board will meet for its spring meeting March 31 to April 3 in New York City to continue rebuilding NABJ and to conduct strategic planning sessions. Details will be posted on NABJ.org.